A scoop of protein powder blended in a smoothie boosts its muscle-building benefits, but can create an unsavory, gritty texture. To save a smoothie after putting in protein powder, add a few healthy ingredients to make it more appealing. If you cannot finish your protein powder smoothie, you can save it in the refrigerator or freezer without sacrificing taste. Fresh, canned or frozen fruit instantly sweetens a smoothie and adds a pleasant, thick consistency. If you have a vegetable smoothie, add fresh or frozen chopped greens to make it more flavorful. Either addition helps to contrast blandness or grittiness from protein powder. Add the fruit or vegetables about 1/4 cup at a time until the taste and consistency is pleasant. Opt for frozen fruits and vegetables if the smoothie is too thin, and fresh fruits and vegetables if it is too thick. To keep the same consistency, add a combination of frozen fruit and water, or a few ice cubes with fresh fruit. Combining fruits or vegetables with other ingredients can help save a smoothie after putting in protein powder. 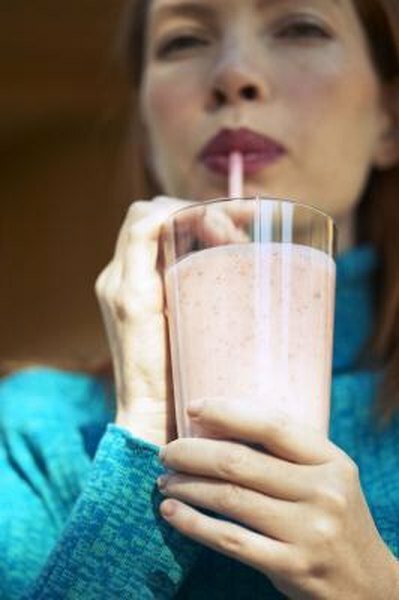 Yogurt, milk, soft tofu, fruit juice, fruit juice concentrate, sugar or sugar substitutes, flavor extracts and nut butters can help amend a smoothie with too much protein powder. Add your chosen ingredient 1 to 2 tablespoons at a time. Thoroughly blend the smoothie and then taste it after each addition until the texture and flavor appeal to you. Pour your protein powder smoothie in an airtight container and refrigerate it as soon as possible to save it. Drink the protein powder smoothie within four days. The best way to revive the smoothie is to place it back in a blender and add a bit of frozen fruit or vegetables. This thickens its consistency and refreshes its flavor. In addition, mixing it in a blender prevents protein powder from sinking to the bottom and creating sludge in your smoothie. If you do not plan to drink the protein smoothie within four days, or if you want to eat your smoothie like a frozen treat, freeze it. Place the smoothie in the freezer directly after stirring it or pulsing it in a blender to evenly distribute the protein powder. This lessens protein powder buildup at the bottom of the frozen smoothie. Be sure the smoothie is in an airtight container to prevent freezer burn. When you are ready, remove the smoothie from your freezer and allow it to defrost in the refrigerator for about 30 minutes. This softens the smoothie for it to break down in the blender or allows you to eat it with a spoon. A protein powder smoothie keeps in a freezer indefinitely, but tastes best within one to two months. Flavored protein powder, such as vanilla, chocolate or strawberry, which matches the basic flavor of your smoothie can enhance it. Flavorless protein powders work best with powerful flavors or smoothies that should not be sweet. Vanilla and chocolate protein powders go well with most fruit-based smoothies and anything with a sweet underlying flavor. If possible, use a flavor of protein powder that matches your favorite smoothie ingredients. If your current protein powder does not taste good in fresh or leftover smoothies, try a new brand. Some individuals find particular brands unappealing.